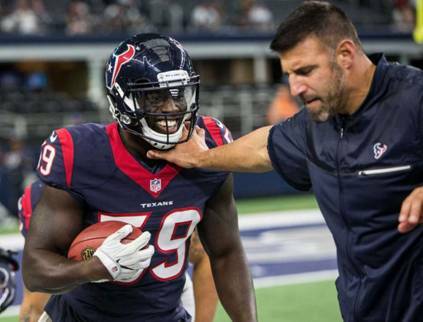 Texans linebacker Whitney Mercilus, left, enjoys a lighter moment with Mike Vrabel, his position coach, before a game this season. When Mike Vrabel was a versatile All-Pro outside linebacker for the New England Patriots who doubled as a potent red-zone threat as a tight end and earned three Super Bowl rings, many of his conversations with coach Bill Belichick revolved around his future. Vrabel saw himself as a future coach, and now he is one for the Texans who's in demand as a linebackers coach scheduled to interview for the Los Angeles Rams' head coaching vacancy. Vrabel declined the San Francisco 49ers' offer last year to be their defensive coordinator, receiving a raise and additional responsibilities to remain with the Texans. "Yeah, we talked about that several times during his career," Belichick said. "Mike does a tremendous job. As a player he was very astute, had a great understanding of his position and technique and how to play his spot and corresponding positions from an overall standpoint. He had a very good grasp of the overall defensive and offensive concepts and how they would attack different fronts. We talked about that. "Of course, I never worked with Mike as a coach. As a player, he certainly showed those qualities. A lot of players understand the game well and have a good awareness, but Mike has good leadership, good communication. He's direct. He gets along with everybody, has a good way of working with people, got good leadership skills. Those things are very important." Vrabel is regarded as a tough, passionate coach who relates well to his players. The former Patriots standout has a demanding style, but he also communicates well. He's been instrumental in the development of Jadeveon Clowney, Whitney Mercilus, John Simon and Benardrick McKinney with veteran Brian Cushing remaining productive under his coaching tenure. "Coach Vrabel has done an unbelievable job of teaching me where to be, in the right spot," said McKinney, who leads the Texans with 129 tackles and also has five sacks. "He's an unbelievable coach. He loves the game of football. He tells us how much he loves coaching us. He's a great coach. I'd be happy with whatever coach Vrabel decides to do. He's a great guy and a great coach."